Volborthite was the new sensation in the Tucson Show 2015 as well as in Ste. Marie, but the number of them seems to be somewhat limited. 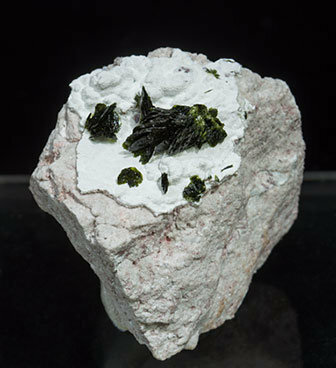 Rosette aggregate, on matrix, of flattened and very well defined crystals that are bright with a deep green color. 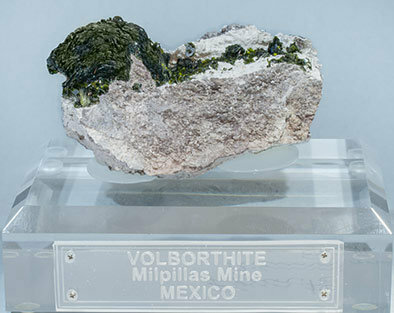 The Milpillas Volborthite samples are probably the world's best for their quality, luster, and crystal size, and they are considered a new standard for this species. An excellent thumbnail. 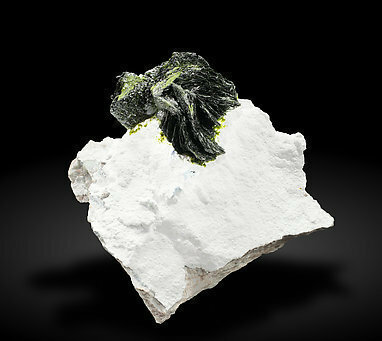 Very aerial group of sharp flattened crystals that are very bright and with a deep green color. The Milpillas Volborthites are without doubt the world's best for their luster, shape, good contrast with the white clay matrix and crystal size, so all together these are a new standard for this species. 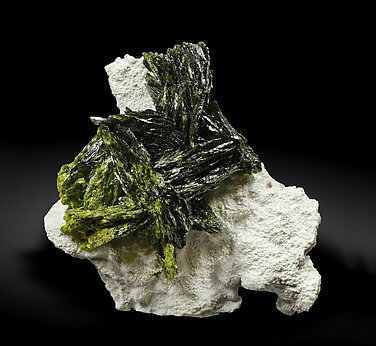 Rosette growths on matrix of flattened Volborthite crystals that are well defined, bright with a deep green color. 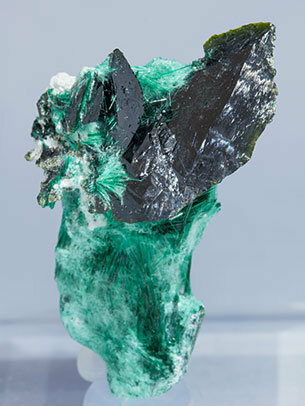 The Milpillas Volborthite samples are considered among the world's best for their quality, luster, and crystal size, and they are a new standard for this species. Furthermore, this particular sample is from the selected group of the best Volborthites found there. 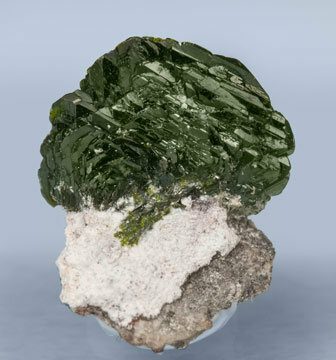 Rosette aggregate of flattened and very well defined Volborthite crystals that are bright with a deep olive green color. 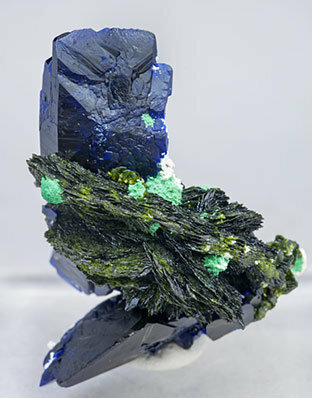 With a very sharp, doubly terminated Azurite crystal on the Volborthite that we must consider a rarity. 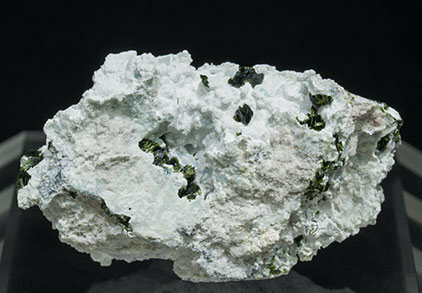 The Milpillas Volborthite samples are probably the world's best for their quality, luster, and crystal size, and they are considered a new standard for this species. An excellent miniature, different from other well-known Volborthites. 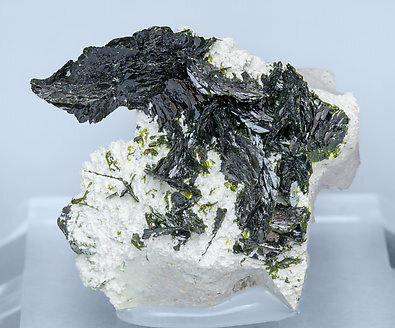 Flattened rosette-like aggregates of very large (for the species) Volborthite crystals. 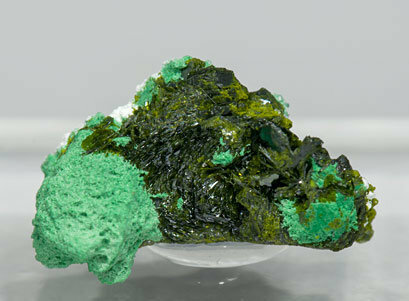 They have a uniform deep green color and are with translucent and bright Azurite crystals and small spherical Malachite aggregates. A miniature of special quality. 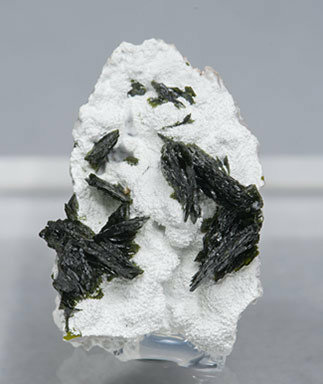 Very aerial aggregate of unusually sharp, isolated and complete Volborthite crystals. 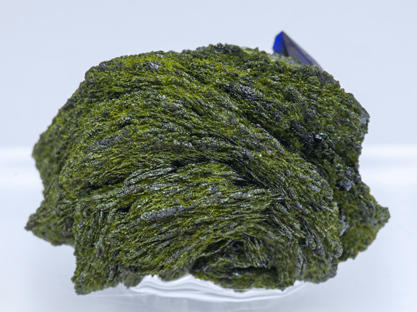 They have very well defined forms, are bright, have a deep green color and are on matrix, with fibrous Brochantite aggregates. A novelty at Tucson 2015. 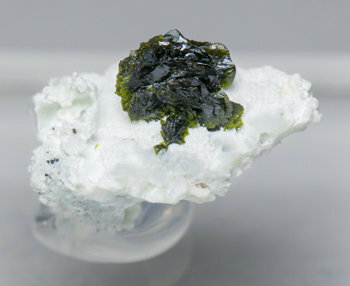 Big and thick Volborthite crystal with deep olive-green color with yellowish shades, partially coated by aggregates of small acicular crystal of the same Volborthite. 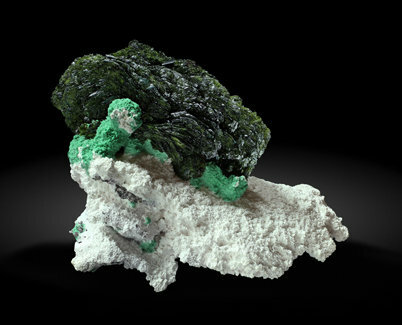 It is on Malachite, and on matrix. Due to the size and the definition of the crystal this sample has an extraordinary quality for the species, a rare copper vanadate. 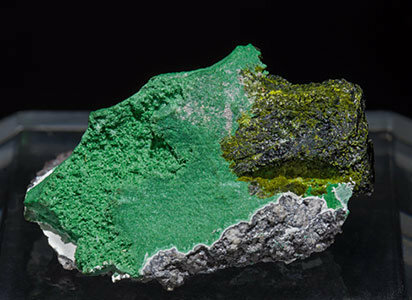 In fact, we are not aware of better Volborthite than those found at the Milpillas mine.